I don’t make New Year’s Resolutions. Do you? My husband thinks of January as a new start. He roars into the year with lists and motivational reminders to eat better, exercise better, be better. For me, January means cold, rain, and less parking at the gym for us regulars because of all those people who made resolutions. Sure, I try to eat better, but come on. I write a dessert blog. My life is about sugar; using it, dreaming about it, and thinking up ways to torture you all with it. I don’t make resolutions, but this year I decided to make goals. A few simple, obtainable goals that I can accomplish on my own timeline, instead of something life-changing that I’ll give up in a few weeks, much like those parking-space and treadmill hoarders in January (by February it’s all back to normal, thank goodness). 4. Host another bake sale for charity, but bigger and better. Organized. I’ll keep you posted on my progress. If you’re lucky you’ll get to see me clinging to the side of a rock wall, terrified for my life because I’m 10 feet off the soft floor and fearful I’ll plunge to my death. Another goal I set for myself in a post last week? Adding crust to my favorite sweets. Fudge can now be checked off that list. 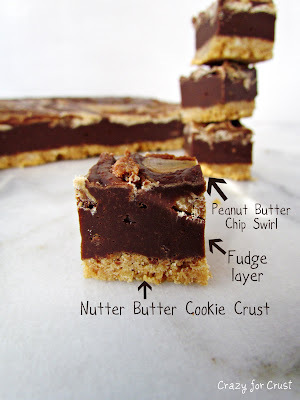 Idea for crust on fudge? Comes from Family Bites. But it won’t be because ohmygod this fudge was so good I’m totally making it so many other flavors. Thus ruining all of your resolutions to eat better. Line a 9x9 inch pan with foil and sprat with cooking spray. Finely crush the Nutter Butters in a food processor. Mix with melted butter in a small bowl and press into bottom of pan. Set aside. Melt chocolate chips and sweetened condensed milk over in a saucepan over medium-low heat until melted. While this is melting, melt peanut butter chips in the microwave (be careful not to burn them). When chocolate mixture is melted, remove from heat, stir in vanilla extract, and immediately pour and spread over crust. 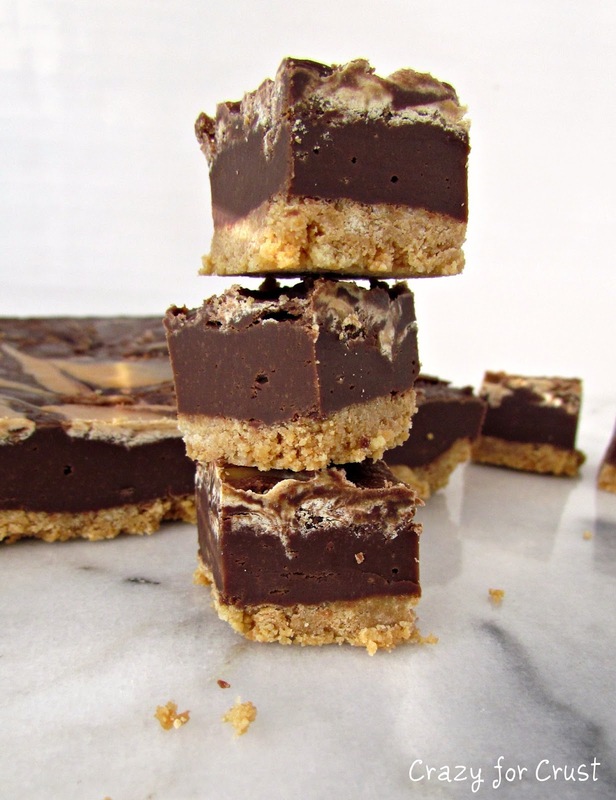 Immediately spoon melted peanut butter chips over fudge, swirling with a knife. 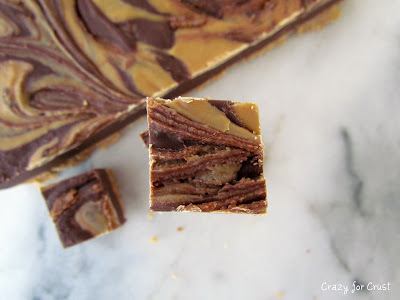 Chill fudge until hardened. Cut into squares and serve. The rock wall climb cracks me up. That is so something I would do! Hide from anyone that I might know. And I agree the new “regulars” at the gym annoy me! Count me in for a bake sale when you plan one! I like to think I will stick to my resolutions…but I usually fail/quit by the afternoon of the 1st:-) I am all about the fudge lately. I am loving the swirl and the crust!!! I’m all in on the bake sale idea – just say when! When I saw Nutter Butter… I had to click over. 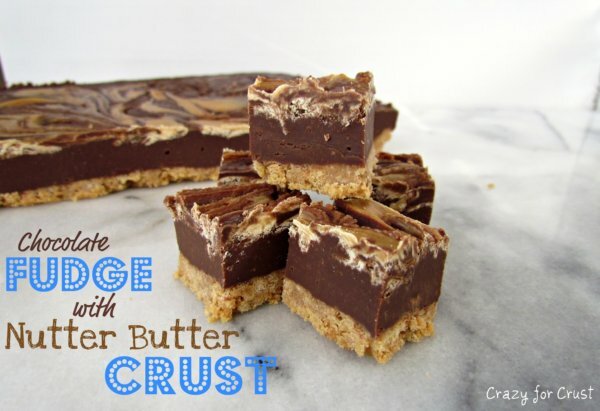 Will definitely have to try these… nutter butter is my favorite cookie of all time! One of mine too! I bake with them… a lot! Nutter Butter Cookies are not sold in my country. Are there any alternatives that would have similar end product? Thank you! Any sort of sandwich cookie would work. Nutter Butters are a peanut butter sandwich cookie – so if you can find something like that, just use it as a substitute! Enjoy! I love love love everything about this site!! I had a great time just reading through the recipes and laughing! I will definitely be trying some of these recipes! Especially the quick and easy one! I bought some no bake smores at a bake sale and Google the recipe! Viola! I am now one of your biggest fans! !